Phycox HA Small Bites Soft Chews For Dogs 120/bottle taste great to dogs, but the HA formulation contains no mammalian protein! That makes them safe and efficacious for your allergic canine patients. 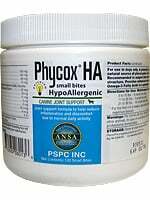 Phycox has developed and carries a quality line of hypoallergenic products for use in cases of canines with food allergies. All of our hypoallergenic products are made with the same ingredients as our other products (including our patented* and highly effective anti-inflammatory Phycox) but do not contain the common ingredients that cause allergic reactions in dogs. Together with our HA Soft Chews Hypoallergenic, Phycox HA Small Bites Canine Soft Chews are part of Phycox's hypoallergenic range and were designed with smaller dogs in mind. The small size of the Small Bites makes them ideal for small to mid-sized dogs that weigh between 5 and 30 pounds. To make them suitable for dogs with food allergies, Phycox HA Small Bites Canine Soft Chews are formulated with absolutely no mammalian protein or grain. These flavorful chews are therefore guaranteed to not contain beef, chicken or wheat, the most common canine allergens. The rich, natural (and highly appealing) liver flavor comes from pork liver and therefore should not cause problems in dogs with allergies. Of course, these hypoallergenic chews still contain all the beneficial ingredients of our other Phycox products.